Magdalena farmer turned vlogger Perpekto Samparada touring his viewers around his farm on video. It used to be that the only ones who could see his farm are those who could make the trip. 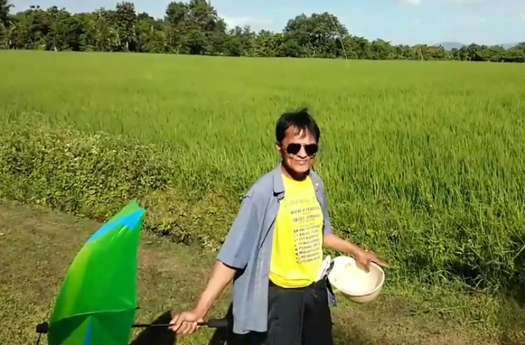 But after learning how to shoot and upload videos on social media, he can now share the simple joys of farm life to more people through the Internet. Samparada was among the newest graduates of the Smart Millenniors program in Magdalena, where a group of seniors and farmers learned more about smartphones, mobile data, video streaming and social media with the help of youth volunteers from the Farmers Information and Technology Services Center and Laguna State Polytechnic University. To test their skills, the participants took on a special “Millennior Vlogger” challenge, and were asked to share a snippet of their lives on video and upload them on Facebook. Fellow Millennior Romy Javier also shared a video sneak peek into his usual workday in the rice mill. “I almost did not make it to deadline because my wife got sick,” he shares. “But I really wanted to submit a video, so I asked the volunteers who assisted me during our sessions to also help me with it.” His video showed Javier touring the viewer around the rice mill, lifting heavy sacks and demonstrating how to use the equipment there. Stephanie Viterbo, one of the volunteers who helped Javier with his video, shared that she was proud of their ‘joint project’. “I was inspired by Kuya Romy’s desire to learn and participate in the challenge,” she said. The video submissions showcased snippets of farm life alongside scenes of active senior citizens doing volunteer work for other seniors at the Magdalena senior citizens affairs office or joining the regular morning Zumba in the Magdalena town plaza. “Magdalena is 75% agricultural, and with my video, I wanted to share to the world just how rich and beautiful our town is,” Samparada added. Herself a casual social media user, Sy said Magdalena’s Millennior vloggers are an inspiration. “Seeing the videos our farmers and seniors uploaded have inspired me to know more about social media myself. I look forward to the other stories our farmers can tell with their smartphones,” she said. The Smart Millenniors program of PLDT wireless unit Smart Communications aims to teach elder Filipinos about technology, particularly about the basics of smartphones, mobile data, social media and video, with the help of youth volunteers. To honor the best Millennior vloggers, Smart also awarded smartphones to the winners of the challenge as special prizes. “We are proud to see the fruits of our partnership with the DA and the DA-Agricultural Training Institute in upskilling our farmers,” said Darwin Flores, head of community partnerships at PLDT and Smart. “We hope that our Smart Millenniors in Magdalena will serve as an inspiration to more farmers and seniors in other areas of the country, and help spread the word on the good things that can be done through technology, smartphones, and social media,” Flores added. For its efforts in expanding the technological know-how of seniors across the country, the Smart Millenniors program was recently awarded a Silver Anvil at the recent 54th Anvil Awards. Since its launch in 2017, it has already conducted sessions with seniors around Metro Manila, Cebu and Cagayan de Oro.